Explanation: Sculpted by stellar winds and radiation, a magnificent interstellar dust cloud by chance has assumed this recognizable shape. Fittingly named the Horsehead Nebula, it is some 1,500 light-years distant, embedded in the vast Orion cloud complex. About five light-years "tall", the dark cloud is cataloged as Barnard 33 and is visible only because its obscuring dust is silhouetted against the glowing red emission nebula IC 434. Contrasting blue reflection nebula NGC 2023 is visible on the lower left. 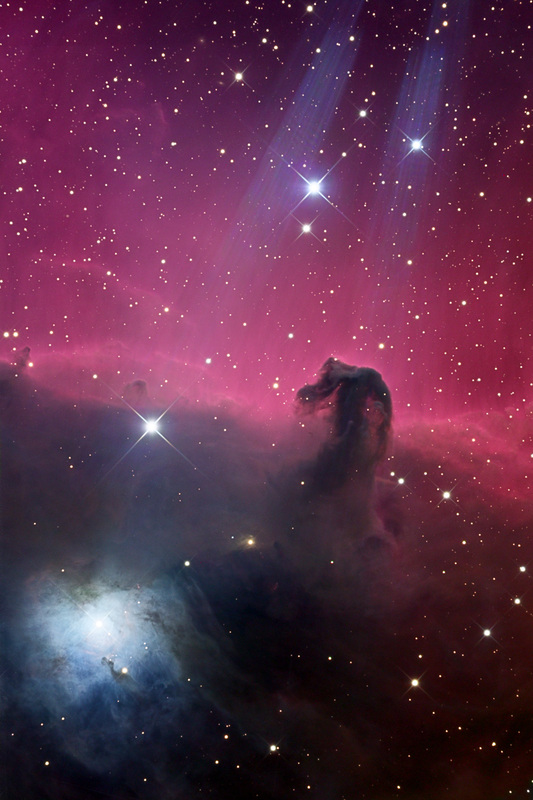 In this gorgeous color image, both Horsehead and NGC 2023 seem to be caught in beams of light shining from above -- but the beams are actually just internal reflections from bright star Sigma Orionis, just off the upper edge of the view.